It is widely recognized that Canadian children are lacking adequate levels of Omega-3 fatty acids. 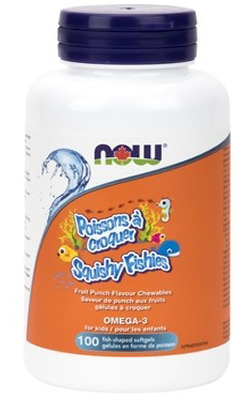 NOW® offers this unique fish oil supplement with natural fruit flavour and a fun fish shape that kid’s are sure to love. NOW® utilizes a unique and patented encapsulation process that incorporates natural fruit flavours, xylitol (a natural sweetener) and cellulose into this, fish-shaped capsule shell to make a great tasting and smelling nutritional supplement that is easy to chew and swallow. We utilize only cold-extracted and purified BioPureTMtuna oil in the natural tryiglyceride form, offering enhanced absorption. With a naturally high DHA content and our extensive quality and purity testing, this product is sure to be a favourite among parents as well. Non-Medicinal Ingredients: Softgel (gelatin, glycerin, water, xylitol, cellulose), Natural Fruit Flavours (lemon, strawberry, orange), Tocopherols. Tested for heavy metals, PCB’s and dioxin. BioPureDHA™ is a registered trademark of Bioriginal Food and Science Corp., Saskatoon, SK, Canada. Take with meals. Children 3-18 years: Take 2 softgels, 1-3 times daily; Adults 19 years and older: Take 3 softgels, 1-3 times daily. Choking hazard. Please ensure that your child chews the product thoroughly before swallowing.